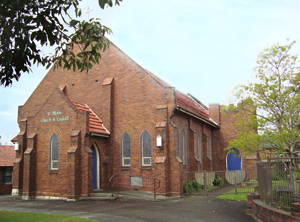 St Mark's is an Anglican Church situated in the Sydney suburb of Northbridge. This church family is made up of a wide variety of people united by our belief in God and his Son, Jesus Christ our Lord. We give first place to the Lord Jesus, and welcome anyone who knows him, or wants to know him. Our church is a community within a community. Its a community of Christians (people whove been persuaded that we need Jesus Christ) within the community of Northbridge (a suburb that needs Jesus Christ), and the people of St Marks think the world of both  we love our church, and we love Northbridge too. Our church community exists to enhance Gods reputation. So we take the Bible very seriously because we believe God speaks to us. We also take the privilege of prayer very seriously because we believe God hears us when we pray and that he is willing and able to respond  even beyond our expectations. Were also very serious about seeking to love each other as generously as we have been loved by God! But our church community is also open, not closed. At Northbridge Anglican, were so excited about being Christians and so excited about Jesus Christ that wed like everyone to know who Jesus is and what he offers. For that reason, we welcome visitors enthusiastically and we also seek to lovingly and respectfully take the message of Jesus out to the people of Northbridge, and beyond. We meet on Sundays in the St Marks church building for services at 8:15am (traditional), 9:30am (informal family-friendly service), and 5pm (informal with a crèche for young children). We also run a Sunday School in conjunction with our 9:30am service where school-aged children can enjoy learning about God too. During the week there are several different groups that meet at the church and in peoples homes for further study of the Bible, to pray, and so the members can care for each other.